I have erased an EEPROM of FT232H of Analog Discovery (not Analog Discovery 2) due to my mistake. Launching WaveFormus "No supported device detected." is displayed. Could you tell me the setting of FT_Prog? 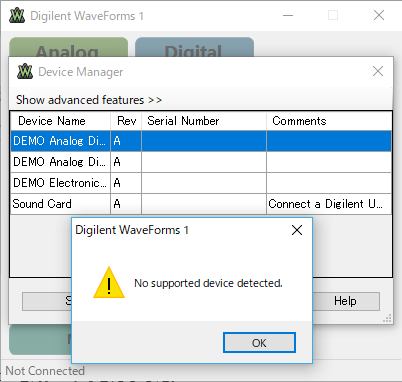 If you download the latest version of WaveForms, available on the WaveForms Resource Center, https://reference.digilentinc.com/reference/software/waveforms/waveforms-3/start, you will be able reprogram your Analog Discovery (original) as described in this specific post here. The newer WaveForms (since it looks like your are using an older WaveForms based on your screenshot, also supports the original Analog Discovery. As per the given instructions I got the Analog Discovery(original) to work properly.